Earlier I suggested that a derivative of the Offshore Patrol Cutter might fill the role of a frigate. It now appears that a ship with the OPC’s DNA has been proposed as a frigate for the Royal Navy and has been offered to the US Navy. The Babcock Arrowhead 120 is the latest of five candidates for the Royal Navy’s Type 31e (the other four are outlined here). The common thread is Vard designs. The family tree looks like this. Róisín-class patrol vessel, two ships, 1500 tons, 79 meters (259 ft) in length, 23 knots, built by Babcock, commissioned into the Irish Naval Service in 1999. Protector-class offshore patrol vessel, two ships, 1900 tons, 85 meters (279 ft) in length, 22 knots, built by BAE Systems Williamstown, Australia, for the New Zealand Navy, the first commissioned in 2010. Samuel Beckett-class offshore patrol vessel, three ships completed and a fourth under construction, 2256 tons, 90 meters (300 ft) in length, 23 knots, built by Babcock and commissioned into the Irish Navy Service in 2014. 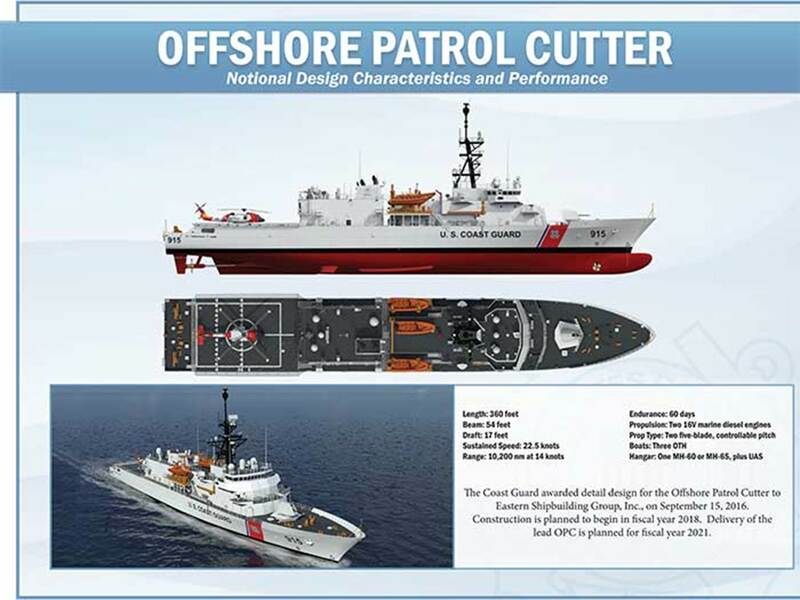 USCG Offshore Patrol Cutter, 4,000 tons, 110 meters (360 ft), to be built by Eastern in the US with the first expected to be commissioned in 2021. NavyRecognition has the most complete description of the ship I have seen so far, and also has three protos of a model of the proposed ship. Babcock is offering the design to meet the US Navy’s frigate requirement. The length is up ten meters compared to the OPC, as I thought might be the case, but I am a bit surprised at the reported beam, 19 meters. Since the OPC is 4,000 tons full load and the Arrowhead proposal is both ten meters (33 ft) longer and 2.5 meters (8 ft) greater in beam, the full load displacement of the Arrowhead would likely be considerably greater. The 4,000 tons reported may be a light displacement, meaning this ship is actually larger than the FFG-7 class. Given the relatively small stacks and the 24+ knot speed, this is obviously an all diesel ship. It will be economical to run and have a long range at relatively high cruising speeds. While I think 24+ knots may be enough, most of the ships to be escorted make 20 knots or less, a speed well below the 29 knots of the FFG-7 class will be a hard sell to the US Navy. 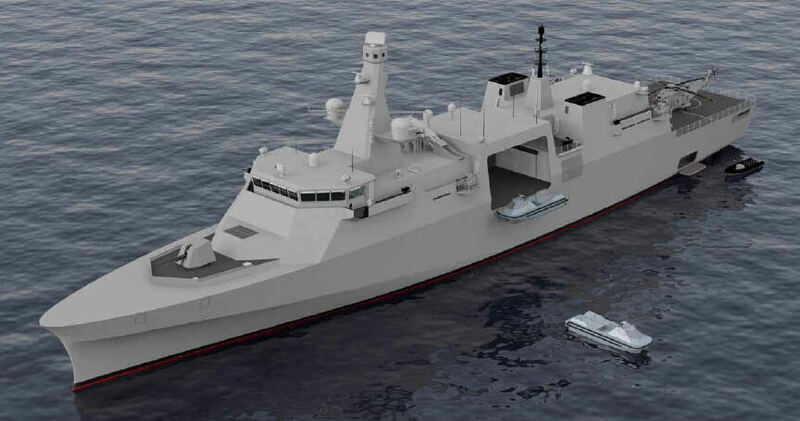 NavyRecognition also has news of another of the Type 31e competitors, the BMT Venator-110 also apparently being proposed to meet the US Navy requirement. Meanwhile BAE is also offering the much larger and more expensive Type 26 to the USN as well, however with its size and cost (U.S. $4.9 billion for the first three British ships) approaching that of a Burke class DDG, I think that is a long shot. 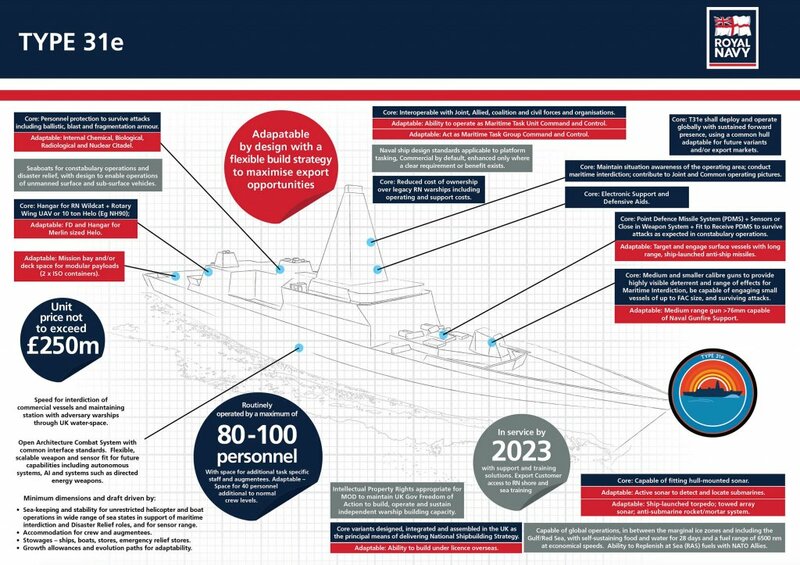 By contrast the Type 31e is being designed to a price of 250M Pounds or about $340M. That much lower price may be the Type 31e’s best selling point. This entry was posted in Europe, Shipbuilding by Chuck Hill. Bookmark the permalink. An interesting comment I’ve seen in a few Irish forums is that other than it’s length (10m shorter) it’s not too much different from the RFP that the INS put out back in ’06ish for Eithne’s replacement (in terms of speed, capability). I wonder given Babcock was working with the INS back then (as you mentioned the Roisin’s) if it started for the Irish EPV? To me Eithne (https://en.wikipedia.org/wiki/L%C3%89_Eithne_(P31)) always looked very much like a Coast Guard 270 foot WMEC (https://en.wikipedia.org/wiki/Medium_endurance_cutter#Famous-class_cutter). They were very much contemporaries with the first 270, Bear being commissioned early in 1983 and Eithne being commissioned in late 1984. Yeah sorry for the Acronyms but you are right. As I said I’ve seen some questions as to whether Babcock might have been working on said design for a while. As to Eithne, from the designer of the ship, the Coast Guard were very impressed with her as a design. He was over in the States working with them in regards to the Daulphin’s. He claims that their view was Eithne was a quieter platform and a more survivable one than the WMEC’s were. It’s sad considering the effort they put into her that the project when wrong, there was meant to be 3 of them and to use Lynx’s instead of the Daulphins. The inter service feuding that went on are in no small part why the P50 and P60 classes didn’t have helicopter capabilities. I see Eithne as an improved 270. Certainly moving the gun up a deck made it more survivable in heavy seas. The additional 8 feet of length would have also been welcomed. I was in CG Headquarters when the 270s were being designed and wrote the Resource Change Proposal justifying the training facility for the COMDAC (Command, Display, and Control system) that was installed on the ships. It was a Coast Guard designed ship and the Chief Engineer was determined to keep the cost down. Designers of the ship practically had to go down on their knees to add three extra feet to the ship, to give the bow a little sheer, otherwise it would have been a 267. In terms of Eithne the only major regret that the designer had was not carrying the Flight deck all the way to the stern, other than that he was quite proud of her, they tried selling the design to the Indian’s as well, but sadly with the Cobh yard in liquidation nobody would buy into the project. A question of the OPC as a 4,000 t FLD ship as LOA 360 feet, beam 54 feet, draft 17 feet whereas the Dutch Karel Doormann class frigates with LOA of 122.3 m/ 401 feet, beam of 14.4 m / 47 feet , draft 6.1 m / 20 feet is quoted as only 3,320 t FLD. A murky area as length and beam not specified at waterline and draft not specified with or without HMS. The OPC’s beam is 15% greater than the Doorman class, while the Doorman is 11% longer than the OPC so we would expect the OPC to be larger but the displacement difference is 20% greater for the OPC. That is explained by the fuller hull form of the OPC. The Doorman’s hull form is designed more for speed, and tapers over more of its length, while the OPCs hull is close to its full beam over much of its length. Since the Arrowhead 120 has such a large beam (19 meters) and is in the same design family as the OPC, I would expect its proportions to be more similar to the OPC than to Doorman class. No mention of the Coast Guard except in reference to our use of “Parent Craft” as design precursor. No mention of NSC or OPC. The OPC has a better shot than the Type 31. Both are just paper ships right now and do not meet the requirement to be a proven (in the water) design.